I'd like to take the time to welcome you to my web site. You will find all the services I offer along with some very useful information dedicated to the digital photographer. The web site is divided into different categories for easer navigation. 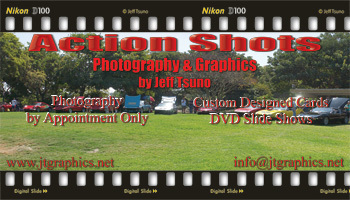 Services I provide range from Photography, Photo Retouching & Restoration, Custom Graphic Designs along with creating custom DVD's of slide shows from your photos and movies and webpage designs. I also can provide several computer related tasks such as trouble shooting and data recovery. I have several pages with some of the basic and most useful Photoshop tutorials dedicated towards digital photography's most common problems to help you correct your photos. Take a look around and have fun its all free. All links can be found on the page Titled "All Digital Camera Page"
This page also has my Custom Curve for the Nikon D100/D70 "jt_all-in-1Curve.ntc" which is used by photographers all around the world with excellent results. Custom designed cards personalized invitations for birthdays, baby showers or any occasion you may need. Photography by appointment only to cover special events and products shoots. As a freelance photographer I provide a place to buy photos which I have taken at various events I have attended. Recovery of lost data due to accidental deletion or formatting on many different media types. If your looking to get your presence on the internet for advertisement and exposure contact me. Search Engine Submission Service is also available along with advice on getting you listed. 6 color Commercial printing also available email any inquires you may have and I can have one of our sales reps call you back.